hese SoC’s are fabbed on 22nm architecture and Intel is soon getting into 14nm Broadwell in the latter period of 2014. The dual-core Merrifield has a max clock of 2.13GHz (base clock speeds not quoted) and a shared 1MB L2 cache. At 2.3GHz, Moorefield has 4 cores and has double Merrifield’s cache size. Merrifield updates from the Clover Trail+ architecture by introducing better graphics through IMG’s PowerVR Series 6 (Rogue) GPU and the improved performance offered by Silvermont cores. 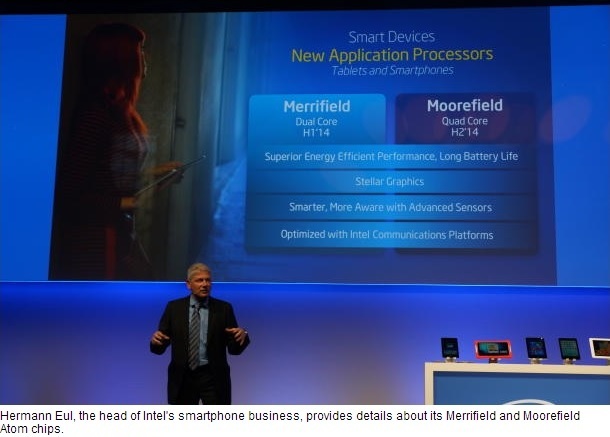 Intel’s mobile roadmap for 2014 mentions no 32-bit chips, all its demos for the 64-bit architecture have been done on recompiled Android kernels. There has been no official word on 64-bit Android, this is however expected in the June Google I/O conference. Currently the Merrifield supports Android 4.4.2. Strategic partnerships have been formed with Asus, Lenovo and Foxconn to develop mobile devices that run on the newly minted Atom chips.